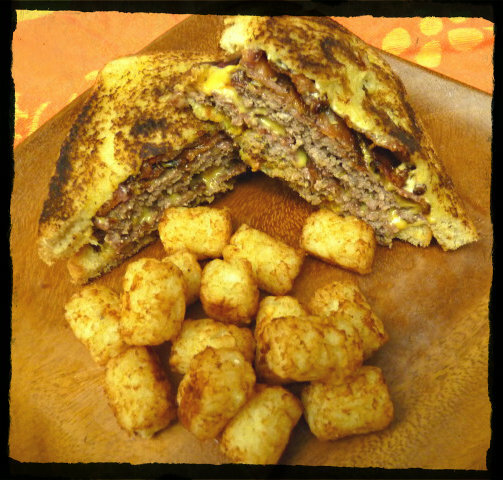 Last week, my buddy Dyal made some Bacon Cheese Patty Melts on The Barbecue Bible Forum and they looked so good I knew that I was going to have to make one for myself. 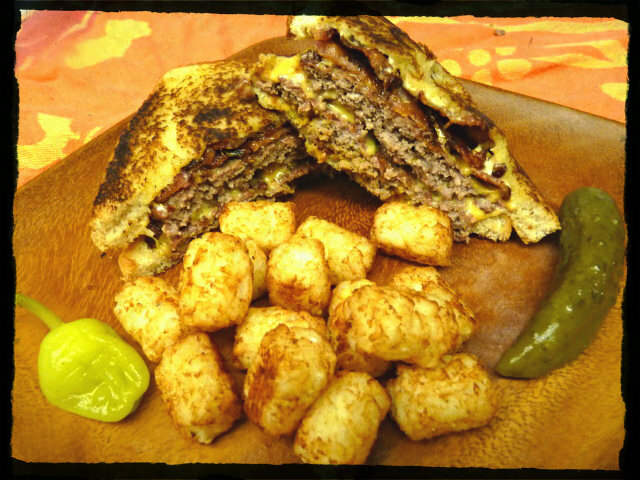 I like hamburger buns as much as the next guy, but sometimes I like my burgers on some grilled, toasted bread. Do you like bacon? Do you like burgers? Do you like bacon on your burger? How about bacon IN your burger? I picked up 3 lbs of chuck to grind, some for these burgers and some just to have later on. When I was cubing up the chuck prior to grinding, I really wasn’t liking the fat content of this particular chuck. For burgers, I like to have about 20% fat and this wasn’t cutting it. How could I up the fat percentage? How about throwing some bacon in while the chuck was being ground up? This being the first time trying it, I only added in 5 strips of bacon. The meat got a double grind through the 3/8″ plate, with some Dizzy Pig Cow Lick and some Cluck and Squeal Beef Specific Rub mixed in after the first grind for some extra flavor. 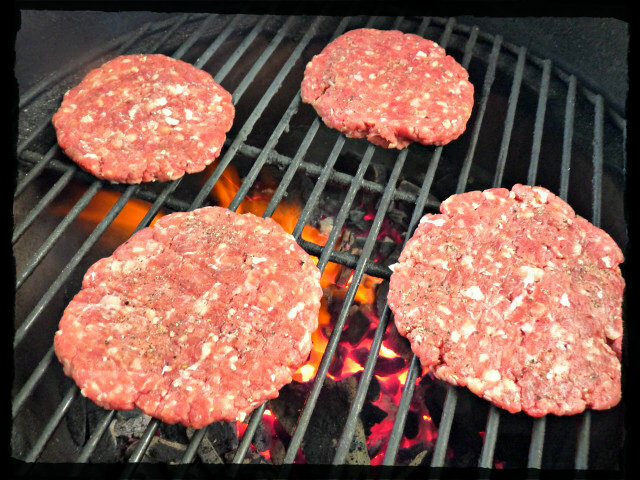 For these burgers, we used 1 lb of meat to shape 4 patties extra thin. In hindsight, that was way more that we should have, but if you have a big appetite, knock yourself out. 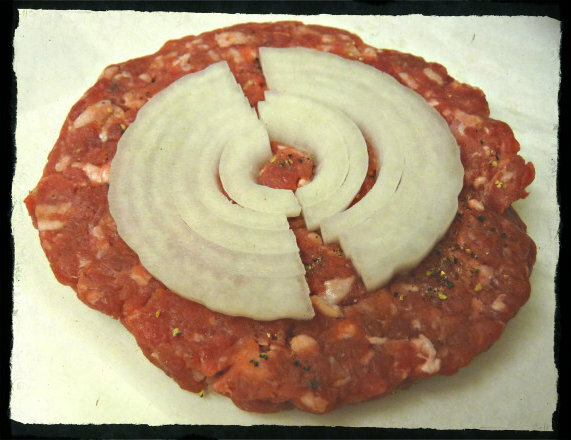 Mrs. G likes grilled onions on her burger and decided to press the onion right into her patties prior to grilling. The patties went on to the Egg for a direct grill at 450F. 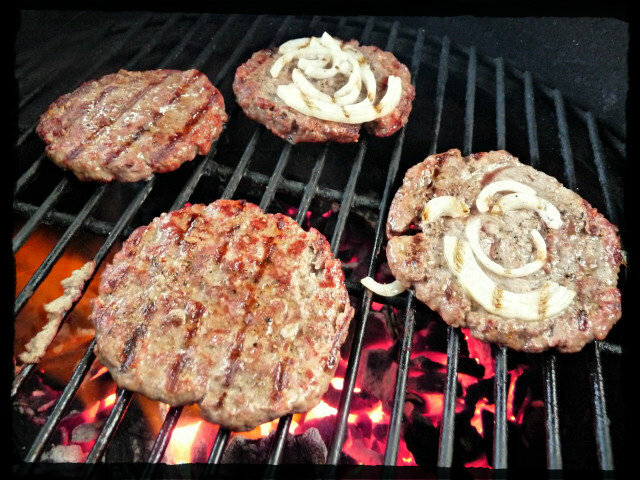 Since we formed these patties pretty thin, I knew they were going to grill up pretty fast. I flipped them after 3 minutes. A few minutes later, and the patties were done. At this point, Mrs. G was able to assemble her burger, but I had a few more steps to go. I started by warming up a pan and toasting lightly toasting two slices of bread on one side so it would hold up to the juiciness of the burger and wouldn’t get soggy. I then buttered the other side of the slices of bread, assembled my burger (with the toasted side on the inside of the burger) and grilled it just like you would do a grilled cheese sandwich. 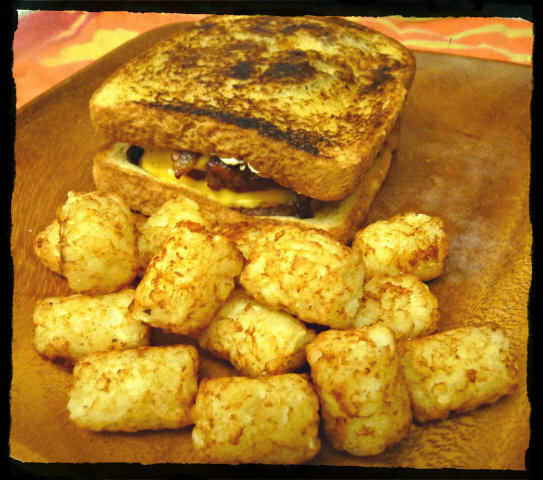 How can you beat a good ole patty melt? Looks delicious, Jason! This time I will have to say that your burger looks better than Stacie’s. 😉 :D. I’d eat both though. Heaven on a plate. HEAVEN! Thanks, Jen. It was mighty tasty. A half a pound burger would have me comatose for a whole afternoon! It does look delicious. I love the idea of adding bacon to lean meat. You made me jealous too; I don’t own a stand mixer so don’t have a grinder attachment. I want one so, so badly. Ah well. I’ll live these moments vicariously through you. It put me down for the count. I don’t use a grinder attachment. I actually have a stand alone meat grinder/sausage stuffer, the Kitchener #12. Runs about $100. 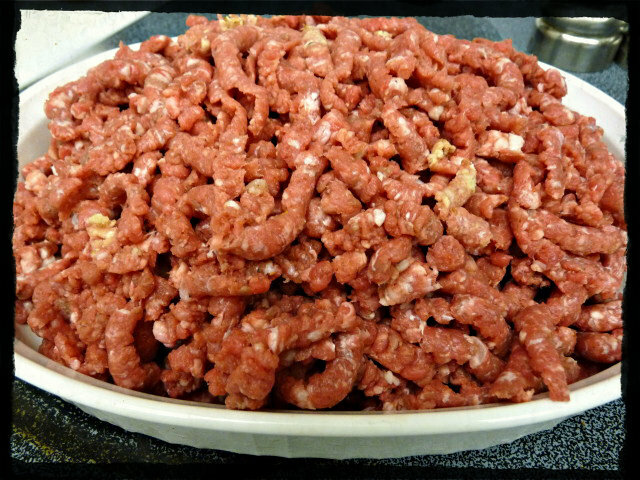 Not the best out there, but great for small batches of meat grinding and sausage stuffing. Think I’ll be trying to make some bratwurst this weekend. Man, that’s just beautiful! I’m in love! 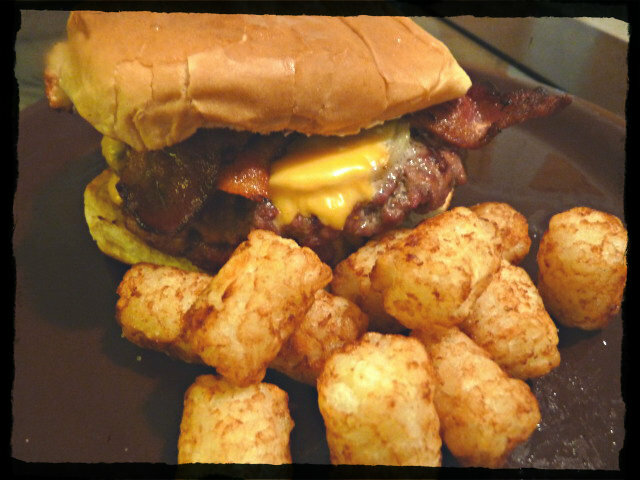 And you even served it with tots! Outstanding! Thanks. I was looking at your site last night for awhile, but I started drooling and my stomach strated rumbling, so I had to turn it off.